Raisin and cinnamon mocha by Grainaissance. Just cut, bake, fill and serve! Mochi is a Japanese rice cake that is made from steamed and pounded mochi rice. It is traditionally eaten during the New Year holidays to bring good luck. The traditional way to make mochi is to steam glutinous brown rice and pound it with wooden mallets (kine) in a wooden mortar (usu). The resulting sticky mass is then formed into cakes. This process is extremely labor intensive. Raisin-Cinnamon Mochi - so easy to make! As much fun as making mochi sounds, I was quite excited to find a mochi product that was ready made. I walked past the Grainaissance mochi packages in the market a number of times wondering what you're supposed to do with them. They look like a slab of very hard clay. Curiosity got the best of me one day and I brought home the "original" flavor which is basically unflavored brown rice. I cooked the mochi according to directions and was very excited to see how they puffed up. But I just ate them plain without filling them or dipping them in a sauce. Although I enjoyed the contrast of the crispy and gooey textures, I found the taste to be a little boring. So the next time I tried the Raisin-Cinnamon mochi. It was a lot better but it still needed something. The third time I made them, I prepared a sweet filling of dates, walnuts and Tofutti Better Than Cream Cheese. I also drizzled the filled puffed dessert with a little agave syrup. The result was amazing! I'm pretty certain these don't resemble the mochi cakes traditionally eaten on New Year's Day, but it's a wonderful, simple to make, vegan, gluten free dessert no matter what day it is! Cut the mochi into 1" to 2" squares using a heavy, sharp knife. A 12.5 oz package makes about 9 to 16 pieces. Place on cookie sheet at least 1 - 2 inches apart. Look at how they puff up and expand. The tops are golden brown and the bottoms are softer and gooey. Split the mochi - you'll find an empty pocket for filling. Fill with prepared mixture, drizzle agave syrup over top and serve. Place pieces of cut mochi on an ungreased cookie sheet leaving at least 1 - 2 inches between pieces. Bake around 10 minutes, until mochi puffs up and turns golden brown. While baking, mix walnuts, date, Tofutti and cinnamon until combined. Set aside. When mochi is finished baking, remove from cookie sheet and split each piece with a pair of scissors or just tear open. Fill with cream cheese filling and drizzle each piece with 1/2 teaspoon agave syrup. Grainaissance mochi is found in natural food stores and selected supermarkets in the U.S. I found it at my local Whole Foods Market. Call their customer service department at 800-472-4697 to find a store near you or to ask them to get your favorite store to carry their product. They also make Amazake vegan, gluten free, rice shake in 14 flavors. It's hard to believe that 2011 is coming to an end. 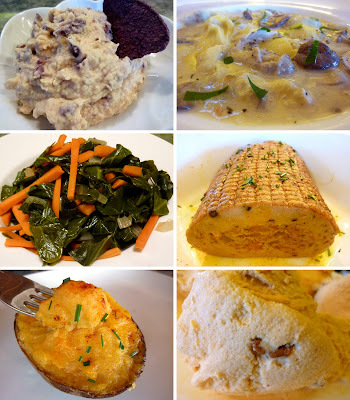 Before I put my full attention to celebrating the holidays with the family, I will leave you with some ideas for a vegan holiday menu. All recipes, except for the celebration roast, are gluten free. For the appetizer, try the roasted garlic and kalamata olive hummus. Hummus is perhaps the easiest appetizer to make from scratch. The basic ingredients include garbanzo beans, tahini, garlic, lemon juice and salt. But you can add many different ingredients to change it around. Besides roasted garlic and kalamata olives, try adding roasted red peppers, artichoke hearts, avocado or spice it up with a jalapeño or cayenne. 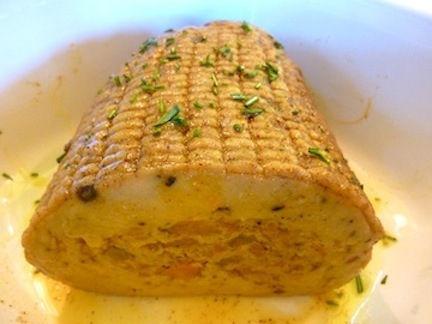 Top with chopped parsley or a drizzle of some good extra virgin olive oil. You can even substitute the garbanzos with different beans, such as Great northern or cannellini. Don't have time? Pick some up at the store, chop up some olives and mix them in. Almost every good market offers ready made hummus. Hummus is versatile and easy to prepare. Now for the soup! I posted this creamy vegan mushroom and artichoke soup with 3 types of delicious mushrooms the other day and I've made it 4 times since then! I brought it to a potluck, made it for my book club dinner, and prepared it for some other friends. Everyone's really enjoyed it so I don't think you can go wrong with this one. Stir in a touch of vermouth or sherry to give it some added complexity. You can make it ahead of time but don't add the coconut milk creamer and fresh parsley until you are ready to serve it. Mushroom and artichoke soup - perfect for the holidays! For the main course this year I've chosen a simple celebration roast from Field Roast. Just rub with some herbs and pop it in the oven and you're done. Field roast products have the texture of meat unlike some of the other faux meat products. This "grain meat" roast is stuffed with Field Roast vegan sausage, butternut squash, mushrooms and granny smith apples. It is made from vital wheat gluten so it's not appropriate for those on a gluten free diet. Also, don't add salt to the roast until you taste it as it is already well seasoned. Find a store near you or buy online. Rub with herbs and a touch of olive oil and bake according to directions. For a few tasty sides, try collard greens with julienned carrots and twice baked potatoes. These can both be made earlier in the day. The greens can be heated and the potatoes can go in the oven right before dinner. Collards and carrots are colorful and festive looking! If you have an ice cream maker, try creamy vegan pumpkin pecan ice cream for dessert. You can blend all of the ingredients a few hours before dinner, store in the refrigerator and put in the ice cream maker 30 minutes before you are ready to serve it. You can either add the pecans to the ice cream maker a few minutes before it is complete or just serve them at the table as a topping. For added yumminess, select glazed pecans! Whatever you serve, have a wonderful holiday and I'll be back soon! Vegan Whole Grain Banana Muffins With English Walnuts (Gluten Free Option) - Perfect For Breakfast On Christmas Morning! Warm vegan banana nut muffins. Can you believe how high they rise without eggs? What's Better than Warm Muffins on Christmas Morning? It gets a bit crazy on Christmas morning and no one is going to sit down and eat a proper breakfast. But you can most definitely get someone to munch on a warm, banana nut muffin while opening gifts! Since the kids will be stimulated enough, the last thing they need is lots of sugar. These reduced sugar muffins only have a teaspoon of sugar per muffin. Increase the stevia and leave out all the sugar if you want but I think they taste best when a combination of sugar and stevia is used. Mix the dry ingredients except the sugar. Combining the sugar with the wet ingredients allows the sugar to dissolve. Scooping the batter with an ice cream scoop makes it easy and much neater to fill the muffin pan! Just about any muffin recipe can be made gluten free by substituting the wheat flour with an all purpose gluten free flour such as Bob's Red Mill. For best results, combine it with xanthan gum. This batch of muffins are gluten free. I used Bob's Red Mill all purpose gluten free flour plus 1 1/2 teaspoons xanthan gum. * For gluten free muffins, substitute flour with Bob's Red Mill or other gluten free all purpose flour plus 1 1/2 teaspoons xanthan gum. Generously grease muffin pan with Earth Balance or a vegan buttery spread and set aside. In a medium bowl, mix flour, (xanthan gum if gluten free flour is used), cinnamon, stevia, baking powder, baking soda and salt. In a large bowl, combine mashed bananas, soy (or other non-dairy) milk, apple sauce, oil, vanilla, flax egg and sugar. Beat well. Scoop batter into greased muffin pan and bake for 18 to 20 minutes or until a toothpick comes out clean when inserted in center of a muffin. When done, remove from oven and cool in pan for 5 minutes. Remove muffins from pan and serve warm or place on rack to cool before storing. Per muffin: 187.8 calories, 8.9 g fat, 1.0 g saturated fat, 0.8 g omega-3 and 2.5 g omega-6 fatty acids, 0 mg cholesterol, 4.0 g protein, 23.3 g carbohydrates, 3.5 g dietary fiber and 190 mg sodium. Vegan Collard Greens With Julienned Carrots - A Delicious Way To Protect Your Eyes! A simple and colorful preparation of collards and carrots. I always wonder why chefs feel compelled to stick meat into an otherwise perfectly healthy bowl of greens. Paula Dean, the queen of unhealthful cooking, has a collard greens recipe with 1/2 pound of smoked meat for only a single bunch of greens! Why would you counteract all the goodness of this vegetable with all that meat - especially smoked meat which is thought to be a carcinogen. This incredibly healthful cruciferous vegetable beat out kale, mustard greens, broccoli, cabbage and even my favorite Brussels sprouts in its ability to lower cholesterol. It also helps your body detoxify and has antioxidant and anti-inflammatory properties. So it's perfect, just as is, or garnished with another beautiful veggie, like carrots! Here's a simple recipe that's colorful, healthful and features the wonderful natural flavor of collards. Clean collards, remove stem and slice into 1" pieces. These lovely greens are from my fall garden. Sometimes doing something as simple as cutting a carrot into little matchsticks can make a dish more appetizing and visually pleasing. Usually I'm in a hurry, but the other night I just felt like doing something a little special. There are some cool techniques, like the one shown in Taste.com where you trim and stack and slice, etc. But you can just peel and cut the carrot into 3 or 4 pieces, depending on how long you want the julienned carrots. Then start slicing until you end up with little match sticks. These slender, julienned carrots only take a short time to cook. Add them in for the last 10 minutes of cooking. Vitamin A deficiency can lead to night blindness, retinal damage and dry cornea which can lead to corneal ulcers and vision loss. Vitamin A, when in combination with other antioxidant vitamins such as vitamin C, E and zinc, may decrease the risk of age-related macular degeneration or AMD. The carotenoids lutein and zeaxanthin are also associated with eye health. Specifically, they may protect against cataracts and AMD. A large research study on carotenoids has shown that people with large amounts of lutein and zeaxanthin in their blood (~5.8 mg per day) have much lower risk of getting AMD than those who have a blood level as low as 1.2 mg per day. This recipe is a bonanza for eye health! * One cup of cooked collards has over 300% the daily requirement of vitamin A. * One medium carrot has over 200% of the daily requirement of vitamin A. 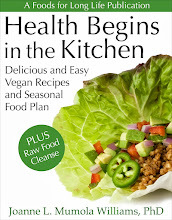 * One cup of cooked collards has 14.6 mg of lutein and its accompanying molecule, zeaxanthin. Note: Vitamin A from plant foods is in the form of "provitamin A" carotenoids (mostly betacarotene) that is converted to "pre-formed" vitamin A or retinol by the body. Heat olive oil and sauté onion for 5 minutes. Add sliced collard greens, granulated garlic, salt, vegetable stock and vinegar. Mix well and bring to a boil. Lower heat, cover and simmer for 35 to 40 minutes until collards are almost done. Stir in julienned carrots, cover, and cook another 10 minutes. Per serving: 99.7 calories, 4.0 g fat, 0.5 g saturated fat, 149 mg omega-3 and 478 mg omega-6 fatty acids, 0 mg cholesterol, 3.6 g protein, 13.6 g carbohydrates, 5.8 g dietary fiber and 201 mg sodium. Creamy Vegan Mushroom And Artichoke Soup With Oyster, Crimini And Shiitake Mushrooms - Perfect For Holiday Menus! This delicious, vegan, gluten free soup is thick with mushrooms and artichokes yet it's less than 250 calories per serving! It's about time to start thinking about holiday menus again. If you love the rich taste and texture of mushrooms and artichokes, this may be the one to serve at your next special dinner! I used crimini, oyster and fresh shitake mushrooms in this but other mushrooms will do. I think Maitake, royal trumpet or just about any of the mushrooms I found during my tour of Gourmet Mushrooms in Sebastopol would do nicely! In this soup, I use crimini, oyster and fresh shiitake mushrooms but others will do nicely! Folding in small diced potatoes to the mushroom mixture. Cooking potatoes in a soup is a natural way to thicken it. 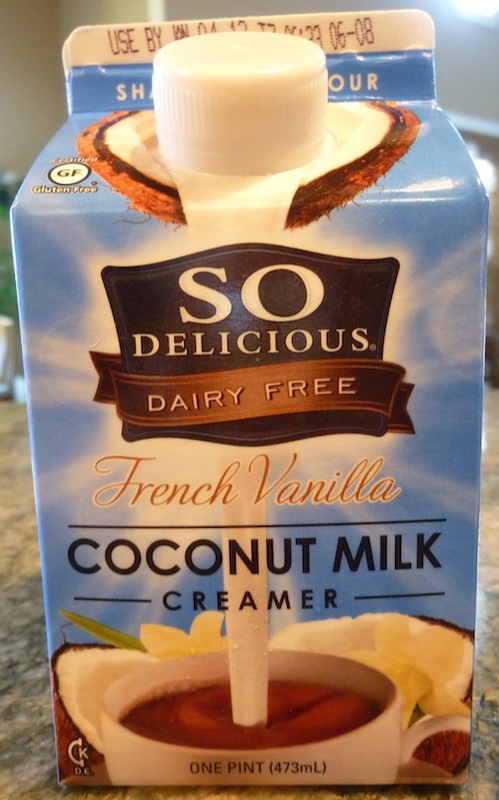 This rich creamer has zero fat and only 10 calories per tablespoon. A perfect replacement for half and half. Heat Earth Balance in a 5 quart Dutch oven and cook shallots for several minutes until soft. Stir in garlic, thyme, black pepper, red pepper flakes, salt and mushrooms and cook 10 to 15 minutes or until mushrooms are tender. Mix in potatoes and then stir in vegetable stock. Bring to boil, reduce heat and simmer, partially covered for 10 minutes or until potatoes begin to soften and the soup starts to thicken. Stir in artichokes and cook another 15 minutes, partially covered. Stir in creamer, heat thoroughly. Serve topped with chopped parsley and freshly ground black pepper. Per serving: 214 calories, 4.4 g fat, 1.4 g saturated fat, 0 mg cholesterol, 5 g protein, 32.2 g carbohydrates, 5.7 g dietary fiber and 526 mg sodium. Fuyu Persimmons - What Are They And How Do You Eat Them? How They Are Different From Hachiya Persimmons. Fuyu persimmons became one of my favorite fruits once I learned how to eat them! My friend Chris came over the other night and surprised me with a big bag of fuyu persimmons from her tree. I absolutely love these little fruits and planted a fuyu persimmon tree in my backyard almost 2 years ago. Unfortunately I have not yet gotten a single fruit. I hear that it can take up to 5 years. I wanted to buy some the other day but they were charging $1.50 each! The best bet is to find an Asian market like the one I shopped in last year in San Francisco that was selling them for only 50 cents a piece. But having a friend like Chris who brings you ones from her tree is actually even better! I'm dedicating a post to this subject because of the big mistake I made many years ago. Hopefully I can prevent this from happening to you. When I was growing up, my father used to bring home these large, oblong persimmons. Today I know that they were "hachiyas" but back then they were just "persimmons" because I was unaware that any other type existed. He would set these out on the counter and patiently waited until they "ripened". Actually, it was more like waiting for them to turn to mush! At the exact moment when they are a soft, liquidy gel, they become this wonderful, sweet and creamy fruit. However, if you eat them a minute sooner, they are extremely astringent and tart. Most people bake with them but me and my dad just ate the sweet, smooth pulp with a spoon. So the first time I bought Fuyu persimmons, I set them out on my counter and waited for them to turn to mush. I waited and waited only to watch them rot. I couldn't image why they never ripened! One day at work, I noticed a table of women passing around a sliced persimmon. The slices were hard like an apple and I wondered how they could stand to eat that astringent, unripe piece of fruit! They offered me a slice and I was shocked to discover this crisp, sweet delicacy wasn't astringent at all! I then learned that this was a Fuyu, not a Hachiya persimmon and that they are meant to be eaten when they are crisp, like an apple.That was a wonderful day in my life! Hachiya persimmons are oblong (not short and squatty like a Fuyu) and must not be eaten until extremely ripe , soft and mushy. 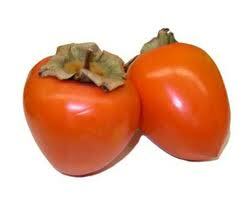 Persimmons in general are very high in fiber providing about 6 grams per fruit. I write a lot about fiber and I will write more in the future as it is one of the most important things missing from the American diet. There has long been agreement that fiber is beneficial in preventing heart disease and diabetes. And, of course, everyone knows that it keeps you going, so to speak. Although I think it's obvious, the jury was still out on fiber preventing colorectal cancer. Well, recently the American Institute for Cancer Research (AICR) has upgraded their findings and now report that high fiber foods protect against colorectal cancer. They recommend women eat 21 to 25 grams of fiber a day and men should consume 30 to 38 grams daily. So eating fruits like persimmons (and pears, which are another high fiber fruit) is a good way to get your daily requirement. My favorite way to prepare fuyu persimmons is just to peel, slice and eat them. They also make a wonderful ingredient for a raw, fall fruit salad. Dice them up and add to diced apples and pomegranate seeds for a crunchy and colorful treat! There's not much you can do to improve the flavor of this wonderful fruit. My favorite way to enjoy a fuyu persimmon is to just peel, slice and eat! Arsenic In Apple And Grape Juice - Why We Should Avoid It Anyway! Apple juice is high in sugar and should be saved for special occasions - like making toasts! Also water it down with bubbly or filtered water. Consumer reports magazine tested 88 samples of apple and grape juice from grocery store shelves. Ten percent of them had arsenic levels that exceeded 10 parts per billion, the U.S. federal drinking water standards. Most of the arsenic was inorganic which is a known carcinogen that has been linked to bladder, lung and skin cancer. Twenty five percent of the juice samples also exceeded the 5 parts per billion level for lead. THE SUGAR IN THE JUICE IS THE REAL DANGER! So instead of giving your children juice, give them a piece of fruit. Pop some apple or orange slices or grapes in their lunch sac instead of a juice box. Not only does the whole fruit provide fewer calories and grams of sugar, it also provides 3 to 6 times the fiber. The fiber in the fruit will stabilize their blood sugar instead of spiking it. If you're at home sipping wine with your spouse and the kids want a "special" drink too, give them bubbly water with just a splash of juice. Since most of you will agree that sugar in excess quantities is bad for your kids, I need not dwell on that. I will, however, show you why fruit is so much better than its juice. 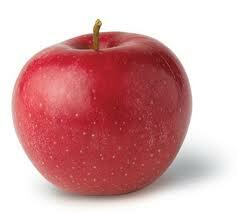 * 1 cup of apple slices has only 1/2 the calories, 5 times the fiber and less than 1/2 the sugar as 1 cup of unsweetened apple juice! 114 calories, 1/2 g fiber and 24 g sugar. 57 calories, 2.6 g fiber and 11 g sugar. 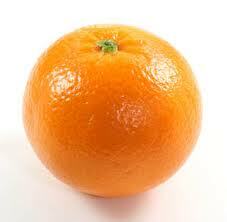 * 1 Navel orange has only 62% of the calories, 6 times the fiber and 57% of the sugar as 1 cup of unsweetened orange juice! 112 calories, 1/2 g fiber and 21 g sugar. 69 calories, 3.1 g fiber and 12 g sugar. 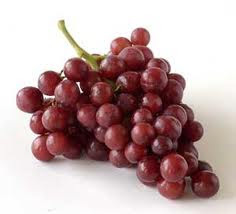 * 1 cup of grapes has 1/3 fewer calories, 3 times the fiber and 1/3 less sugar as 1 cup of unsweetened grape juice! Frozen grapes can be a real treat and a great low calorie dessert but be aware that for young children, these could be a choking hazard. 152 calories, 1/2 g fiber and 36 g sugar. 104 calories, 1.4 g fiber and 23 g sugar. Besides having more nutritional value and less sugar, eating the whole fruit should make you feel safer. Safer because you can see what you are eating! You can tell the fruit is fresh and clean. We don't know the condition of the fruit that goes into making juice. Of course, we can assume the best apples and other fruits are sold as fresh produce. The ones that fall off the trees and have dents and worms (what a disgusting thought) are probably the ones that end up in the juice! Add to that the fact that 83% of the apple juice sold in the U.S. is produced in other countries, (60% of which is from China), where we have little control of their food safety practices. I think I'll stick to eating nice local apples. Eating fruit is all about convenience. I would never think of biting into an apple when I was at work. But every morning my husband put a little bag of sliced apples in my Hello Kitty power lunch box and I munched on them all morning. I would bet that your kids are the same way. If you stick an apple or an orange in their lunch box, there's a good chance that it will still be there when they get home. But apple slices, peeled orange slices and grapes plucked and ready to eat might get more attention! So you and your children should enjoy juice as an occasional treat, not a daily beverage. Dilute it with filtered or bubbly water and use it more as a flavoring. Skip the juice boxes in the lunch sac and put in sliced, peeled or plucked fruit for your child to conveniently enjoy! So Delicious Coconut Milk Creamer gives this vegan ice cream an incredibly creamy texture! I typically just use unsweetened soy milk to make a healthful frozen dessert ( see my Mango Peach and Strawberry ice cream recipes) but since the holidays are here, I stepped it up a notch and added some coconut milk creamer for my pumpkin pecan ice cream. 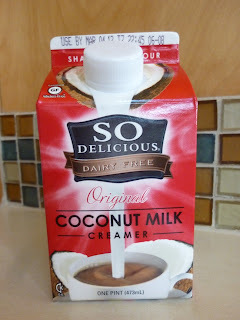 Coconut creamer is fat free but does add some calories. However, it makes a big difference in the texture and creaminess of the ice cream. Even so, this dessert weighs in at less than 100 calories per serving with less than 1/3 a gram of saturated fat! This ice cream has all the flavors of autumn and winter and makes a perfect topping for holiday pies or a slice of ginger spice cake. So Delicious French Vanilla coconut milk creamer is non GMO, vegan and gluten free! During my many years living in Texas, I developed a love for the wonderful pecans grown there. I'm not the only one who feels that way. Luther Burbank, the world famous horticulturist, was quoted in 1908 as saying, " If I were a young man, I would go to Texas, knowing as I do the possibilities of the pecan industry and devote my life in propagating new species of the pecan and doing the same work there in nut culture as I have done here in other lines of horticulture. Your pecan is superior to our walnut and you are standing in your own light - why not develop it?" Pecans make a perfect addition to pumpkin ice cream. 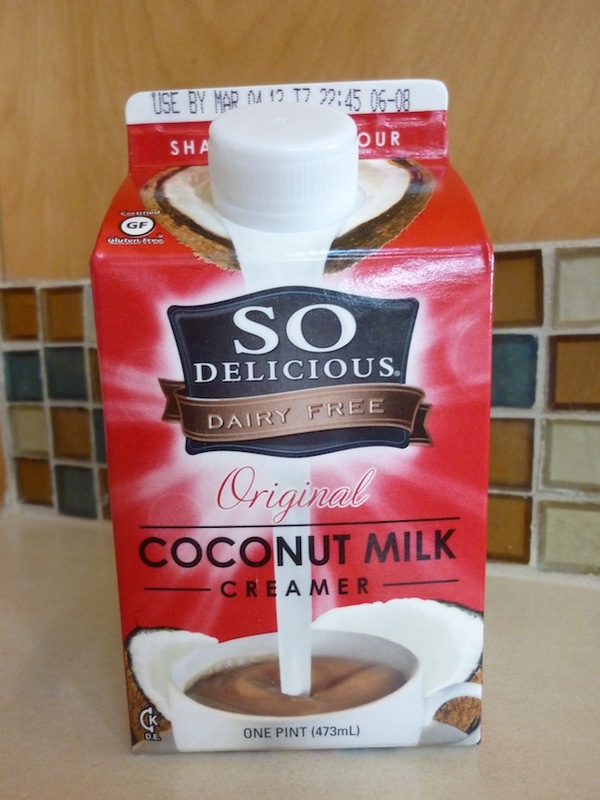 Place coconut creamer, soy milk, banana, pumpkin, pumpkin pie spice and stevia in a blender and blend until smooth. Add mixture to an ice cream maker and process according to directions. Add pecans to the ice cream maker during the last few minutes of processing. Per serving (with 1/4 cup pecans): 97.7 calories, 3.1 g fat, 0.3 g saturated fat, 0 mg cholesterol, 1.7 g protein,15 g carbohydrates, 1.7 g dietary fiber and 12.5 mg sodium. Per serving (with 1/2 cup pecans): 121.2 calories, 5.5. g fat, 0.5 g saturated fat, 0 mg cholesterol, 2 g protein, 15.4 g carbohydrates, 2.1 g dietary fiber and 12.5 mg sodium.